Hi all, need help to connect HP Officejet Pro 8610 to my new Pixel 2. 2. Cleared the Print Spooler cashe and memory. 4. Tried to manually add the printer using the name and IP address. 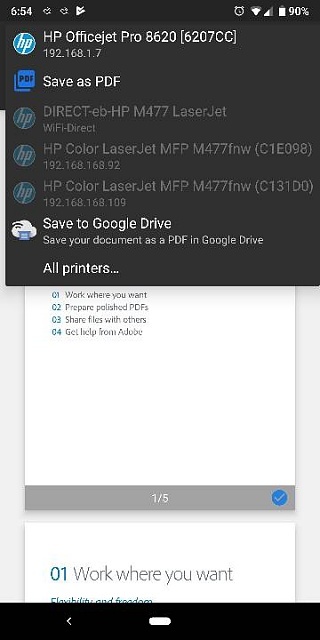 Still no luck - HP Print Services app says "Searching for printers" for a while, then gives up..
Any similar experiences out there? Would appreciate some tips on how to solve, please. Thanks for your comment. This is a consumer printer. Prior to switching to Android I used it to print and scan from my apple phone using the HP Smart app. I have the same problem with my P2, and just gave up. I sure hope that you find a solution and let us know!! I also have an HP printer. I have used the Printer Share app with the premium key for my home printing. It works. My phone Huawei Honor Play is not recognized by HiSuite but I can transfer files from computer. How do I stop blocked calls from leaving a voicemail on my S7 edge? How do I disable calendar notifications on my Pixel 3 watch? All times are GMT -5. The time now is 05:34 AM.